this is just a placeholder for the slideshow -- how does it get inserted? Being an open source software-based start-up itself, Cleversafe sought to 'eat its own dog food' by managing its commercial and developer/user community websites on the same open source software strategy that it leverages as its business model. Plone is the core of the Cleversafe on-line experience. Cleversafe has also been recognized by a variety of industry awards, including the Information Week Start-up 50 Award (2009), Business Week Innovation Award (2008), Wall Street Journal Innovation Award (2008), ComputerWorld Horizon Award (2007), the Infoworld Rising Star Award (2007) and Network World's Top 10 Open Source Projects (2006). 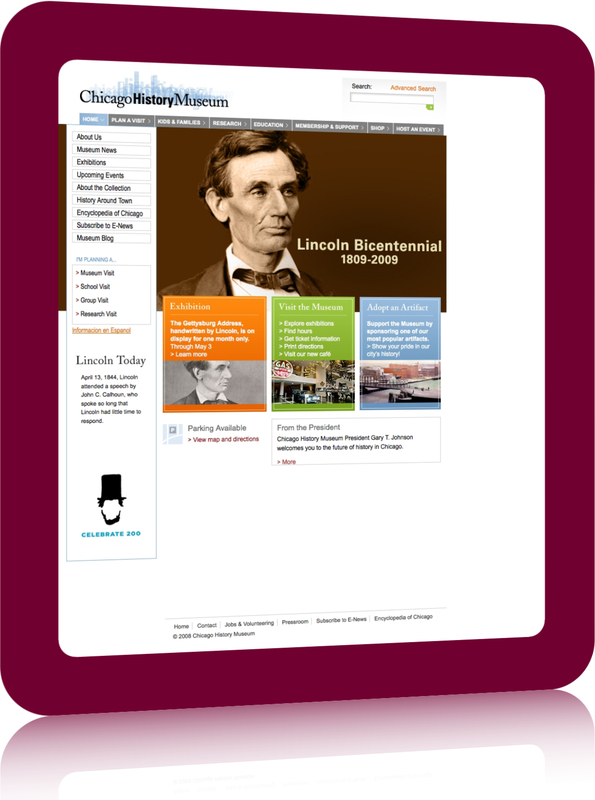 As part of its 150th Anniversary, the Chicago History Museum looked to Plone as its tool to enable easy content authoring and editing by non-technical staff. Plone consultants from Contextual were able to ensure the project was launched on-time and within budget, as part of the Museum's overall marketing campaign that reopened the Museum after significant remodeling was complete, in time for its anniversary. More and more, Free Open Source Software (FOSS), and the Plone CMS in particular, are being used as a smart way for government agencies to get more from the limited tax-payer dollars they have available. Rather than spending 20% of original commercial software license costs year after year, just to maintain a commercial CMS, numerous U.S. military and intelligence organizations have engaged with Contextual to help provide a strategic content management vision, and to deliver on that vision through Plone consulting and support services. Not only have we helped such government agencies install and configure a robust, scalable, professional Plone CMS environment, but we've also helped them build-in elastic scalability and cloud-hosted Plone CMS websites. It would certainly make for a great case study, if we were able to publicly release one. A fantastic, recent development in this area came out of the Department of Defense, whose CIO released a memorandum clarifying DoD's use of open source software (in late 2009.) We were also happy to see Zope (the NoSQL approach to content management) listed in a 2003 report detailing what open source tools are approved for use at DoD, since Plone leverages Zope at the application and storage layers. View the related memoranda from the DoD CIO. There is also a nice, public case study written by one of the CMS project members at NASA that details that agency's selection and implementation processes when it implemented the Plone CMS. View the NASA case study. TCAG (The Center for Association Growth) and its client, the LMA, wanted to add a more rich experience for its association members, by adding online forums, document knowledge base, news, events, for-pay job postings, and a personalized experience. As TCAG's technical partner, Contextual implemented the Plone CMS as the foundation for the personalized member portal that LMA needed, and developed custom integration with the commercial member management application TCAG and LMA have relied upon for years. The result was a Single Sign-On (SSO) solution that allows members to only login one time, regardless of the two or three integrated applications they may visit during their stay, providing for a seamless user experience. Recently, a Plone consultant from Contextual helped LMA integrate their Plone based job board functionality with a custom .Net application to enable self-service ecommerce functionality on the job board.